My daily bible reading included Jeremiah 4:23 today. 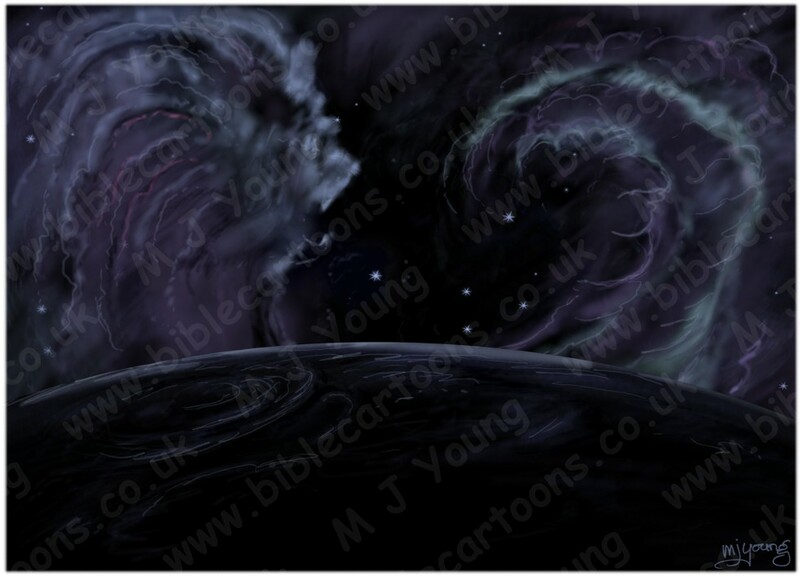 I was intrigued by the reference to the formless earth & decided to draw that subject. Jeremiah was quoting from Genesis 1:2 “The earth was empty, a formless mass cloaked in darkness. And the Spirit of God was hovering over its surface.” I went straight into my CorelPhotopaint program & drew the scene on the computer, without my usual ink outline drawing. As I drew the scene I saw a lion appearing in space, looking away from the viewer, & looking as if it was roaring. That seemed very apt: as a lion (Aslan) was used by C. S. Lewis to depict Jesus Christ in his Narnia novels. The scene has only taken a few hours to complete, which is pretty good for me!